Electronics and appliance retailer Hhgregg is no longer content to have game shoppers drive past them on the way to the GameStop. Starting Black Friday, November 28th, all 109 retail locations will begin offering video game bundles, packed with popular games and various other accessories. These are commonly known among the game-savvy as "Parents Don't Know Any Better" packs, and will come in both console and handheld flavors. Kicking things off on Friday is a Wii Bundle, consisting of the console, two Wii remotes, Wii Sports, Big Beach Sports, Sonic Riders, Code Lyoko, an AV cable and a 2GB memory card. “Our knowledgeable sales force will provide our customers with expert advice on the new gaming merchandise offered at hhgregg as part of our superior purchase experience that is unmatched in the industry,” said hhgregg President and COO, Dennis May. Expert advice on products they've only just now started carrying - that's the Hhgregg promise. Hopefully the experts sell the nunchucks needed to complete that bundle.hhgregg Launches Gaming Business Across Chain Retailer to Provide One-Stop Shop for Popular Video Game Bundles INDIANAPOLIS—(BUSINESS WIRE)—Indianapolis-based appliance and electronics leader, hhgregg (NYSE:HGG) today announced its entrance into the gaming business. The retailer will be selling video game bundles with popular games and various other accessories in each of its 109 locations across its nine-state network, beginning on November 28, 2008. “As hhgregg continues its disciplined growth, we are committed to continually assessing our product offerings to best meet the needs of our customers,” said hhgregg Chairman and CEO, Jerry Throgmartin. “We are pleased to now offer our loyal patrons some of the most popular merchandise in the gaming market today. hhgregg will provide our customers with a convenient, one-stop gaming solution, packaging gaming consoles with its respective games, controllers and other accessories. 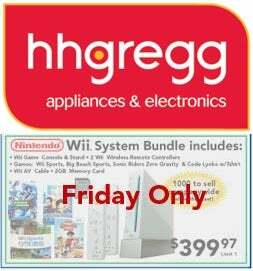 This customer-friendly gaming package will make a great gift for the upcoming holiday season.” hhgregg’s initial assortment of gaming inventory will include Microsoft Xbox 360 Arcade, Xbox 360 Pro, Sony PS3 and Nintendo Wii. In addition, hhgregg will offer top gaming accessories for these platforms, including “Guitar Hero” and Wii accessories. The company will also be carrying hand-held gaming devices, such as Nintendo DS and Sony PSP. hhgregg will be conducting its industry-leading training program with its sales staff to ensure they are properly educated on all gaming products. Renowned for its experienced sales teams, hhgregg associates undergo a rigorous training process to help the customer make the most informed purchase decision possible. “Our knowledgeable sales force will provide our customers with expert advice on the new gaming merchandise offered at hhgregg as part of our superior purchase experience that is unmatched in the industry,” said hhgregg President and COO, Dennis May.